Wednesday, June 12 1907 -- Herriman admonished Angelenos to get out and vote for the Owens River water project, a subject we've discussed earlier in connection with the Mayor Harper on Tour comic strip series. 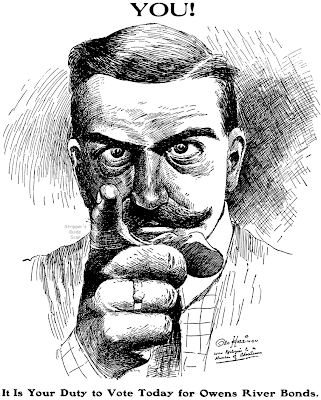 The 'pointing man' imagery was made famous in the "I Want You" posters of World War I with images of Lord Kitchener in England and Uncle Sam in the States. I for one didn't realize that the iconic pointing image pre-dated those, and Herriman here says "with Apologies to a Number of Advertisers", indicating that this was already a popular image in print advertising. Perhaps a blog reader will educate us on the pre-WWI history of this iconic image? 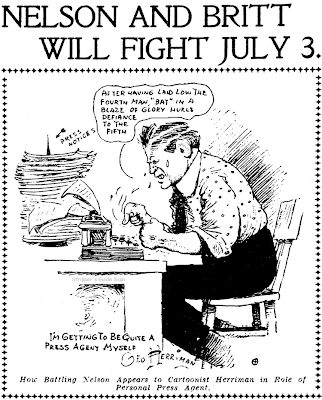 Friday, June 14 1907 -- With manager Billy Nolan in San Francisco lining up the fight, Battling Nelson takes it into his own hands in LA to drum up interest for his upcoming match against Jimmy Britt. Thanks Pat. I'd make a joke about my blog readers being slack-jawed without benefit of my magnificent blog, but in truth everyone I hear from is delightful and intelligent in their comments. One of the most successful cartoonists in the country has created a wild and way-out comic strip in which humor verges on the edge of fantasy. The cartoonist: Addison (Mort Walker). 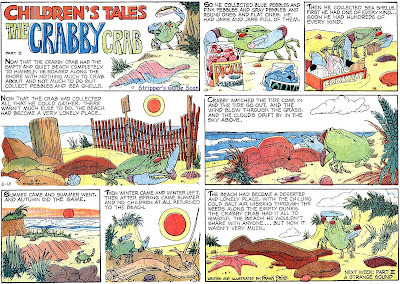 The format: Daily four-column strip and Sunday one-third standard page. The distributor: King Features Syndicate. species of animal on board his ark. After that, the other blunders just seemed to come naturally. A procession of wacky, wonderful, way-out quadrupeds marched into the strip displaying all kinds of quirks and temperaments. The ark is a little cosmos in itself; the animals represent the foibles of man and the ship provides a stage for both wicked satire and innocent fun. The new strip is aimed at young moderns whether they are hip teenagers or adult sophisticates. The byline “Addison” may be a new one to editors and comic strip fans but no secret will be made of the fact that the creator is Addison Morton Walker — Mort Walker — who created “Beetle Bailey,” the popular G.I. strip, in 1950 and the popular family humor strip, “Hi and Lois” in 1954. “Beetle” is distributed by KFS to 1,073 newspapers globally, second only to “Blondie” by Chic Young, which reaches 1,617 papers, according to the syndicate. “Hi and Lois,” which Walker produces with artist Dik Browne, appears in 496 newspapers here and abroad. 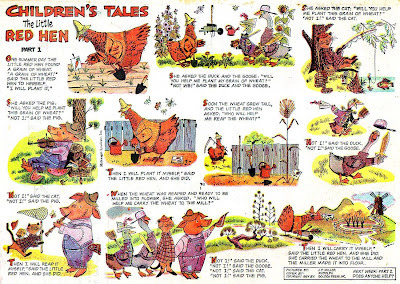 Walker, who was born in Kansas and educated at the University of Missouri, started professional cartooning young, making his first sale at 11. At 15, he was a comic strip artist for a daily metropolitan newspaper and by 16 more than 300 of his cartoons had been published. Walker’s wife is the former Jean Suffill, a graduate of the University of Missouri School of Journalism. They live in Greenwich, Conn., with their four sons and two daughters. 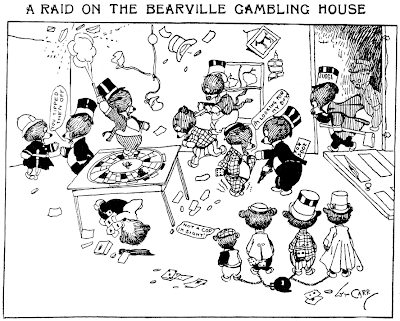 Bearville (aka Bear Land) was the great Gene Carr's very first continuing feature. It ran in the New York Evening Journal for a grand total of six episodes from April 19 to May 7 1901. Carr's bears were pretty much a straight copy of the famed Little Bears, a feature that brought Jimmy Swinnerton a measure of fame in the 1890s at Hearst's San Francisco Examiner. Hearst brought Jimmy out to New York after the Little Bears feature had run its course in San Francisco, and Swinnerton switched from (California) bears to (Tammany) tigers for his attempt to duplicate his previous success. Swinnerton's new animal choice did well by him -- his Mr. Jack eventually evolved from the tigers and popped up in one form or another for decades in Swinnerton's work. Although of course it's impossible to know the inside story of Carr's feature, I like to imagine that the budding cartoonist Carr might have come to fellow Hearst man Swinnerton looking for instruction and advice. 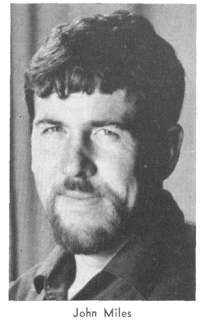 Swinnerton might have shown him a scrapbook of his San Francisco bear cartoons and told him something to the effect of "Hey, bud, try these on for size. They're easy to draw and they got me where I am today!". A big tip of the bearskin hat to Cole Johnson who supplied the samples of this extremely rare and short-lived feature. 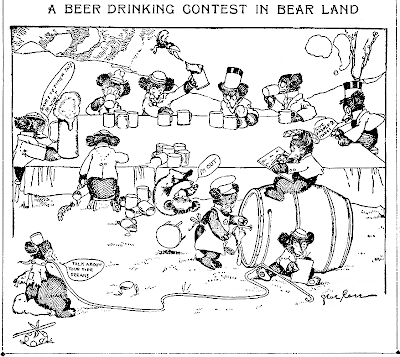 The bears seem to be on the immoral side, drinking and gambling. The Register and Tribune Syndicate is offering a comic strip that is an innovation inasmuch as the cartoon character— “Perkins” — says absolutely nothing but is always getting himself into humorous difficulties within his frame of reference. The cartoonist, John Miles, makes every line in the strip work—the horizons, the borders, the window frames—wherever there is a line, it is likely to become part of the joke. 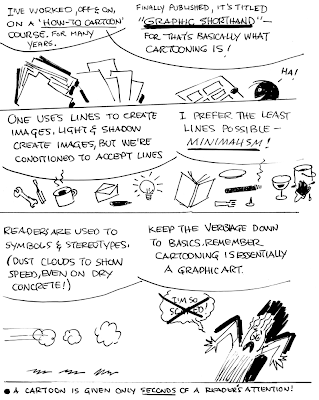 Although Miles describes his strip as “functionally graphic,” comic buffs will recognize it as pantomime. Because pantomime is so rare in America the syndicate’s editors had to cross the Atlantic to find “Perkins”. Miles is a bearded Englishman who resembles a Victorian buccaneer. “Perkins,” his brainchild, came into existence in the London Sunday Times as a once-a-week strip (the first and only comic strip to ever appear in that paper), but Miles quickly demonstrated that he was full of too many good ideas to wait a whole week to present another. “Therefore,” says the syndicate, “he has agreed to do six- a-week and share them with the whole world.” So far the “whole world” consists of 41 newspapers. The 34-year-old cartoonist, described as “a keen observer of situations from which he derives a great deal of his inspiration,” is rumored to be a quiet person (it is hoped, however, he is more talkative than his brainchild “Perkins”), who “doesn’t conform to routine and works during the night if so inclined.” A voracious artist, he’s done portraits, poster, silk screen, advertising layouts, brochures and other commissions. In 1964 he was rated as one of the top designers for his designs of children’s toys. Miles, an art school dropout, now lives “in one of the best known stately mansions in England.” He didn’t always. During his tour of duty with the British Army he lived and served in Germany, drawing maps and geographical designs. Later he, his wife of 13 years, Margaret, and their daughter moved to Bermuda where he worked on the island Press. Tiring of palm trees and incessant sunshine they moved to Greece. he was like mr. bean, posted on our sunday comics page, 70s in manila..
if there is a simple way to say it in shapes or lines, "perkins" ! 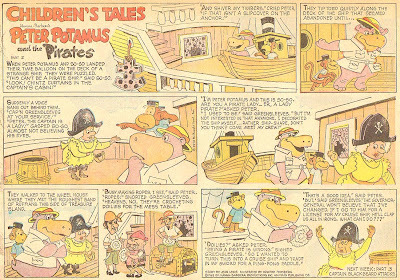 In response to a request made yesterday, here's a few more Children's Tales strips. As you can see the book publishers (and McNaught worked with quite a few on this series) get credited on the strips. It didn't occur to me while I was putting together my index on this series that anyone would be particularly interested in the publisher credits so I didn't make note of them. However, since the titles and creators are given I imagine it would be easy for a children's book fan to determine who published what in book form. My question about the book adaptations is whether the strips are condensations of the books or complete reprintings. I always assumed the former to be the case but maybe I'm wrong. Thanks for that important inside story to this feature, Alberto! This obscure Sunday series is aptly described by its title. The McNaught Syndicate feature was designed to appeal to the younger set, featuring multi-part stories that were meant to interest elementary school readers. 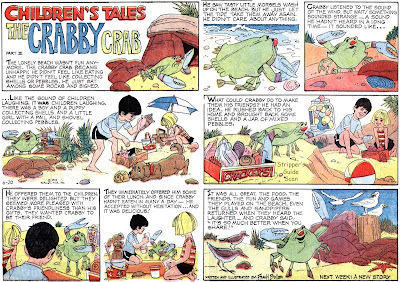 In addition to original material, some stories were adapted from contemporary children's books, others from classics, and yet others featured well-known animated cartoon characters. The information on this series has been terribly hard to track down because it ran in very few papers. This wasn't really a reflection on the quality of the material, though. The strip had two problems that made it unappealing to editors. 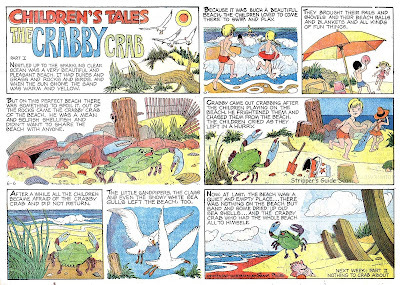 First, it was offered only in half-page and tab formats in an era when most strips were being run as thirds. Second, because the stories were always multi-parters, the strip could never be bumped from the comics section to accommodate an ad (a problem that also hastened the downfall of Sunday continuity strips). It took me the better part of a decade to get the story list as complete as you see below, but its been worthwhile as a number of famous illustrators made their only Sunday funnies appearances in this feature. Later in the run the big name talent disappeared and most stories were written and drawn by the ever able Frank Bolle. I would be VERY interested in hearing from anyone who knows of any earlier or later stories in this series. As far as I know the list below represents the complete run of the feature, but only because this is all I've been able to track down. Just wanted to post a note to say thank you for these invaluable insights; I've been doing some research for a small curatorial project and your notes have been completely invaluable. I'm both really impressed and quite grateful. Thank you! Please excuse the mispelling of your name. I agree with Mark that alot of the titles seems to be repurposed from the Golden Books series, especially in stories that appears to feature Hanna-Barbera characters (Peter Potamus, Huckleberry Hound). The artists listed, such as Hawley Pratt, is also a tipoff. Pratt is best known for directing a bulk of the "Pink Panther" cartoons. He was a layout artist for Friz Freleng during the "Looney Tunes" days, doing most of the character layouts for him. My grandfather used to cut these comics out of the newspaper every week and glued them into a "scrapbook" made from an old magazine. I have all of them through Runaway John Part 3. I wish I had more, but he got sick and passed away in 1972 when I was 9. My comic book scrapbook is a very precious memory of lazy days spent with a grandfather I adored. Do you know what newspaper he clipped them from? Does your scrapbook include any that pre-date "The Little Red Caboose"?